Many kinds of human engineering have biological equivalents - the most famous is probably the ball and socket joint, which is found in car steering columns and human arms alike. The newest and weirdest example is insects with screw-and-nut legs. Weevils are any of about 60,000 different types of beetle. 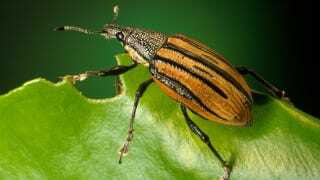 These insects are best known for their crop-destroying habits, as the wheat weevil can damage stored grain while the boll weevil goes after cotton. But that's not why researchers from the Karlsruhe Institute of Technology studied the weevil species Trigonopterus oblongus. Instead, they were interested in the species's anatomy - and they made one seriously unexpected find when they discovered the screw-and-nut legs. In each of the weevil's legs, there are circular threads that cover a total of about 410 degrees, which interlock with similar threads on the inner joint. Muscles are then able to control how much the leg can turn on these threads. We've never seen anything like this before in animals, but the researchers have been able to find the exact same anatomical structure on all weevil species they've studied, suggesting it's a common adaptation for this group. "Such a construction for animal leg movement is quite unusual, as large areas of skeletal parts move on top of each other. Supply of the leg takes place via a very small opening in the center of the screw. Now, we found that nature was first in inventing screws and nuts, because weevils have been using this construction for about 100 million years already." So why do weevils have these unusual joints? The screw-and-nut system, as you imagine, doesn't compare well with the more familiar ball-and-socket system in terms of agility, but it has its advantages. The screw joint allows weevil legs to be located lower down, which makes them better climbers. Weevil legs are also more stable and far harder to dislocate. It's not the prettiest system, but it gets the job done for these weevils.